Ronny Rockel owns Europe — at least for this night. 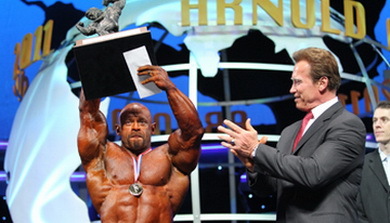 Rockel captured the inaugural Mr. Europe title and in the process qualified for the 2010 Mr. Olympia in the last men’s open qualifying event of the season. He placed 7th at last year’s Olympia and is a legitimate threat to crack the top 6 in Las Vegas in two weeks. Dennis James, competing for the first time in 2010, finished as the runner-up to qualify for his 9th Olympia. Hometown favorite Francisco “Paco” Bautista placed third to grab the third and final qualifying spot for this year’s Mr. Olympia competition.